In this project, started in collaboration with the IRIS Computer Vision lab, University of Southern California, we address the problem of 2D/3D face recognition with a gallery containing 3D models of enrolled subjects and a probe set composed by only 2D imagery with pose variations. Raw 3D models are present in the gallery for each person, where each 3D model shows both a facial shape as a 3D mesh and a 2D component as a texture registered with the shape; by the other hand it is assumed to have only 2D images in the probe set. This scenario, defined as is, is an ill-posed problem considering the gap between the kind of information present in the gallery and the one available in the probe. 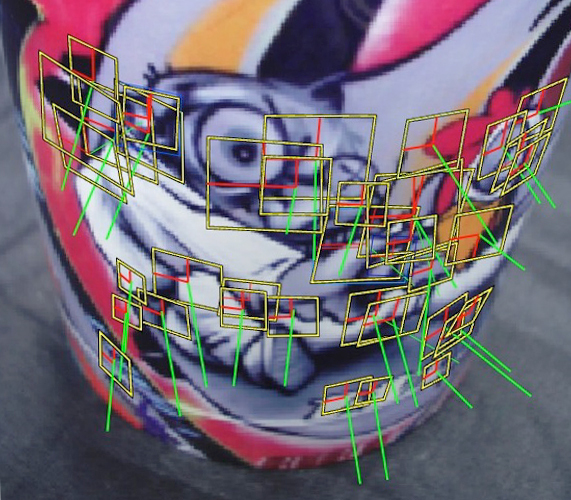 In experimental result we evaluate the reconstruction result about the 3D shape estimation from multiple 2D images and the face recognition pipeline implemented considering a range of facial poses in the probe set, up to ±45 degrees. 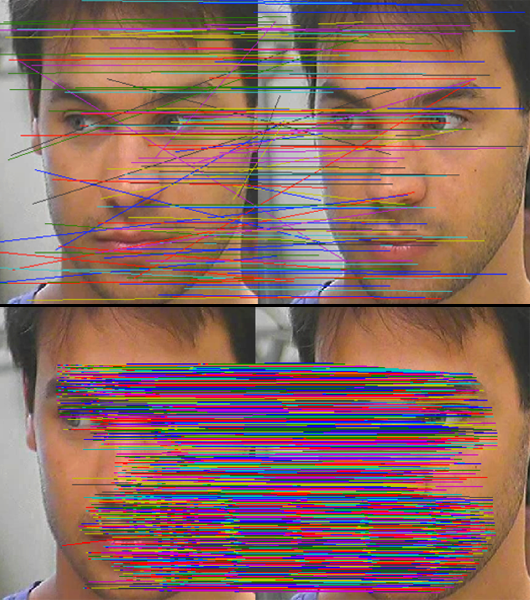 Future directions can be found by investigating a method that is able to fuse the 3D face modeling with the face recognition technique developed accounting for pose variations. This worked was conducted by Iacopo Masi during his internship in 2012/2013at the IRIS Computer Vision lab, University of Southern California. This entry was posted in Intelligent videosurveillance, Projects, Research projects and tagged 2D face recognition, 2D/3D face recognition, 3D face recognition on May 23, 2013 by admin. In this research, we present a novel approach to 3D face matching that shows high effectiveness in distinguishing facial differences between distinct individuals from differences induced by non-neutral expressions within the same individual. We present an extensive comparative evaluation of performance with the FRGC v2.0 dataset and the SHREC08 dataset. The approach takes into account geometrical information of the 3D face and encodes the relevant information into a compact representation in the form of a graph. Nodes of the graph represent equal width iso-geodesic facial stripes. Arcs between pairs of nodes are labeled with descriptors, referred to as 3D Weighted Walkthroughs (3DWWs), that capture the mutual relative spatial displacement between all the pairs of points of the corresponding stripes. Face partitioning into iso-geodesic stripes and 3DWWs together provide an approximate representation of local morphology of faces that exhibits smooth variations for changes induced by facial expressions. The graph-based representation permits very efficient matching for face recognition and is also suited to be employed for face identification in very large datasets with the support of appropriate index structures. The method obtained the best ranking at the SHREC 2008 contest for 3D face recognition. This entry was posted in Intelligent videosurveillance, Projects, Research projects and tagged 3D face matching, 3D face model, 3D face recognition, 3D weighted walkthroughs, iso-geodesic stripe partitioning, performance evaluation on March 29, 2010 by admin.